4E's Novelty Inflatable Beach Balls Pack of 12 Bulk Large 16-inch, Summer Beach & Pool Party Supplies, Beach Ball for Kids Toddlers Boys Girls By by 4E's Novelty at Ipswich Recreation. MPN: 7037. Hurry! Limited time offer. Offer valid only while supplies last. ✔️ Remember the proverb: "Make sure to never run out of the good stuff...". IT'S SUMMER AND YOU GOT TO BE ARMED AND READY TO RAKE IN THE FUN, after all those dreary winter days. Fun at the beach is the epitome of summer fun and without lively colorful beach balls there is simply no fun, stock up with our super useful set of not one, not two, but 12 inflatable perfect size beach balls, and simply have a ball, enough said..
✔️ HAUL IN A LOAD OF SUMMER LAUGHTER, SUNSHINE AND FUN, WITH THIS SET OF 12 INFLATABLE PERFECT-SIZE BRIGHTLY COLORED BEACH BALLS. They are made for Real fun. Jump on them, roll with them, play ball with them, wiggle them in the soft beach sand, arrange them in a huge line and play a knock-them-off game, the sheer possibilities are endless. 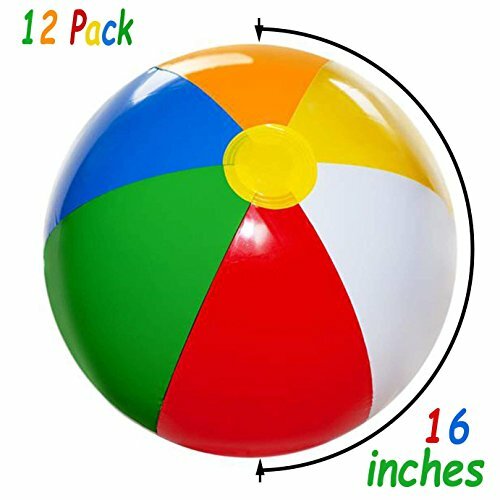 ✔️ It's summer, it's TIME TO THROW OFF THE WINTER DOLDRUMS AND GO OUT AND HAVE SOME FUN AT THE BEACH OR IN THE YARD, and what is a better way to do it, then by buying this set of 12 Inflatable Beach Balls, 16 Inches Big, they are made of durable stuff and will last thru hours of fun, throwing them, punching them, rolling them in the beach sand, or sitting on them at the party, although we won't sell you backslide insurance in case you slide off them while playing.